For context, I was making a tweak to GReyes' answer on this question, just cleaning up some formatting with the trigonometric functions. Specifically, I was turning arctan to \arctan and tan to \tan in the MathJax code. 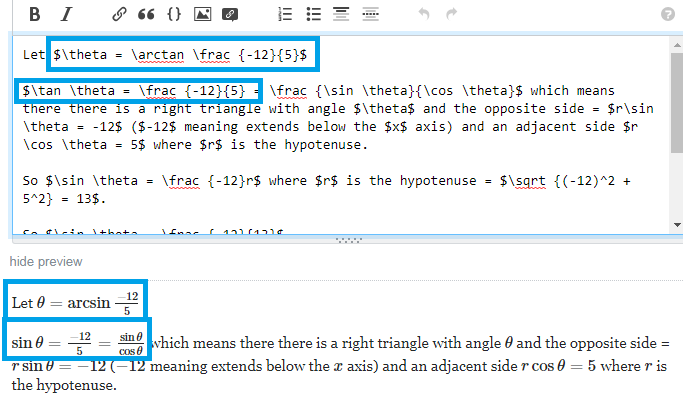 In short, the functions in the preview become sine/arcsine functions instead of tangent/arctangent. On playing around, I noticed this does not happen if I instead put \cos or \arccos, or \sec, \csc, or \cot. Only \tan and \arctan would render as sine and arcsine. Yet other questions that involve tangent/arctangent functions don't seem to be affected: this one and this one for example. Does anyone have any idea what might be causing this glitch? I feel like it might just be something on my end, but I honestly don't know. I admit that I don't know MathJax/LaTeX particularly well - I'm terrible at programming and coding in general, and only know what I do of these from experience and seeing other posts - so maybe there's something dumb I'm overlooking. In which case if this is just a waste of time, sorry. A linked question contained some malicious code in the title. I've removed it. which looks suspicious but my HTML skills are limited so this might be a red herring. Not the answer you're looking for? 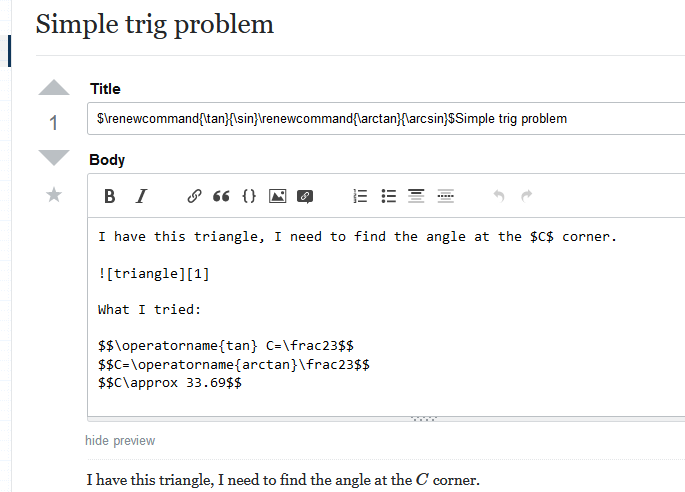 Browse other questions tagged bug mathjax titles newcommand . MathJax rendering in preview but not in actual post?